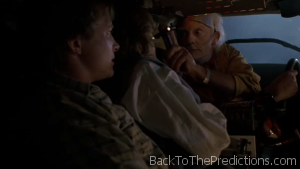 The writers regretted having Jennifer get into the DeLorean, leaving them with a problem for the second movie… How do they get her out of the way? Rather than working her into the plot, why not just put her to sleep for the whole thing? Here comes the “sleep-inducing alpha rhythm generator”. Doc whips it out when Jennifer starts asking too many questions about her own future. Rather than explain to Jennifer what’s going on and why she shouldn’t know too much about her own destiny, Doc decides that unconsciousness is a better solution. If only a device like this existed for nights with insomnia. …or for passengers that are having trouble falling asleep on a red eye flight. …or for people that need to be asleep for medical procedures. It’s a pretty nifty thing, but it’s not real. Although some patents have been granted for alpha-rhythm generators, none resemble the device used by Doc. Patent #7,155,285 was issued in 2006 to use alpha-rhythms for “treating men’s prostate problems or sleep disorders.” …but as a magical sleep-inducing device? No.